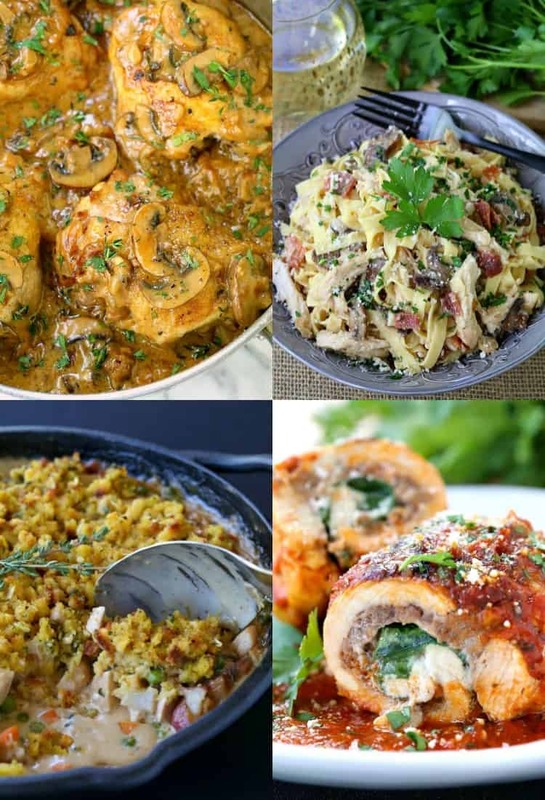 Our Favorite Chicken Dinner Recipes will take the guesswork out of making dinner! 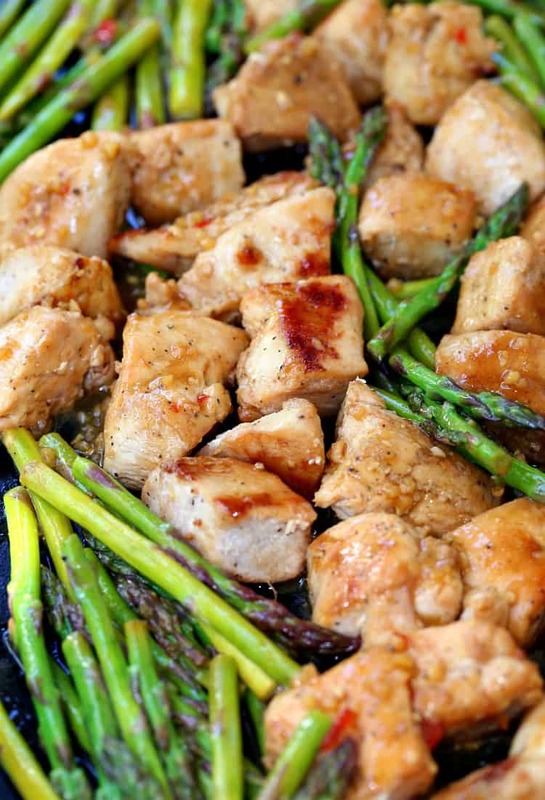 Because we’re always looking for delicious recipes to make with chicken! Sometimes I got the answer I was looking for and sometimes…not. And what answer did I get the most? Little did we know growing up how tough it was to actually just get dinner on the table for your family without someone bringing home take out or ordering pizza all the time. So I’m here to help you take the whining out of chicken for dinner – just tell me who’s going to complain when they get one of these meals. Here’s how this recipe went down. I came home with a huge brussels sprout stalk and asked Christie what we could make with it that I might like. Seeing as I’d never eaten a brussels sprout ever. Nope, not ever. 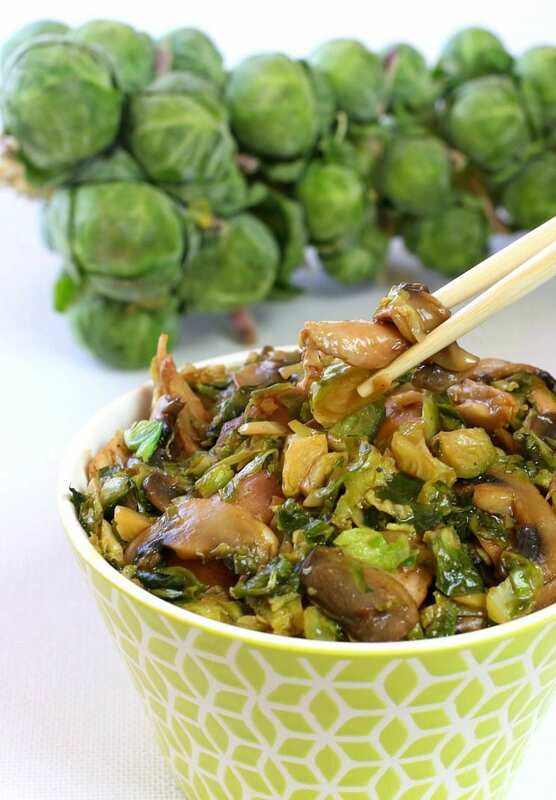 We tossed a few ideas around and came up with this stir fry recipe that has now become a weekly addition to our dinner menus. To make this an easy weeknight meal, grab a rotisserie chicken from the store and save yourself the step of roasting chicken in the oven. 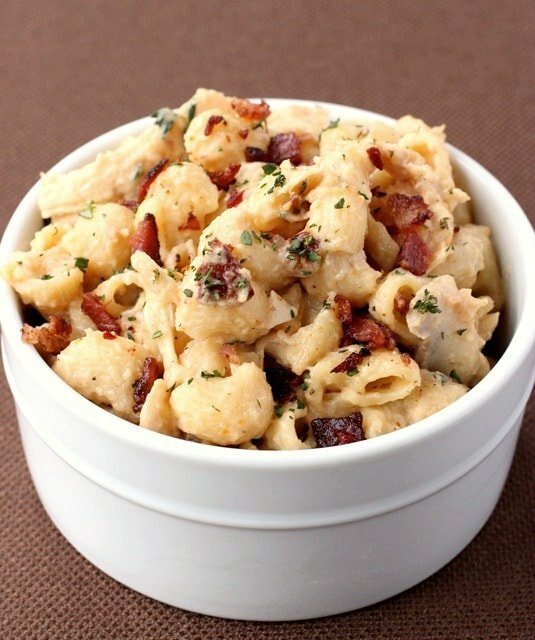 So it’s basically making a cheese sauce, boiling up some pasta and adding the shredded chicken and pancetta or bacon. try the pancetta if you haven’t had crispy, fried pancetta before. It’s like bacon – but better. This recipe is really just a method, again you could grab a rotisserie chicken from the store and then all the toppings you want to pile on. I do like some of the toppings warm and some added on after baking so they’re cold. You can take these toppings here or add any of you’re own that you like, the more the better! This is a good one because you can let the chicken cook in your slow cooker while your out or at work. Then when you get home all you have to do is shred it up and layer it on the tortillas. 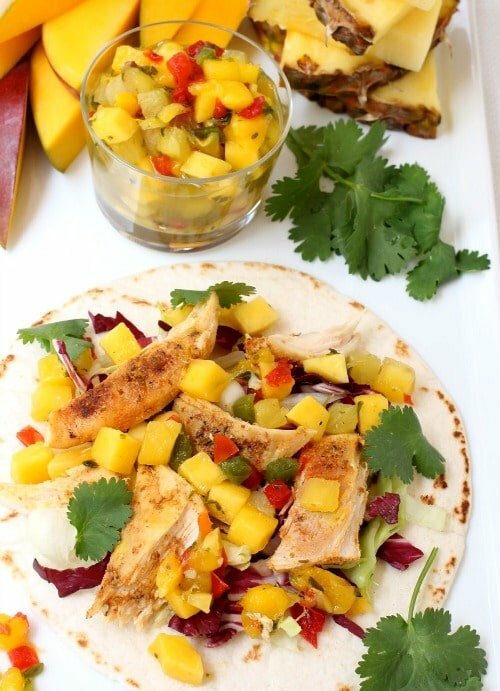 We used a mango salsa from Trader Joe’s for this recipe, but they have something similar in most grocery stores. Or you can dice up a fresh mango and pineapple and throw your own together in just a few minutes. Now as far as the Our Favorite Chicken Dinner Recipes go, these wings are at the TOP. Baked, not fried and coated in the most AMAZING garlic parmesan sauce. Even better than the restaurant version. Hands down. Next on our Our Favorite Chicken Dinner Recipes we’re talking stuffed chicken. The chicken dinners here just keep getting better and better! 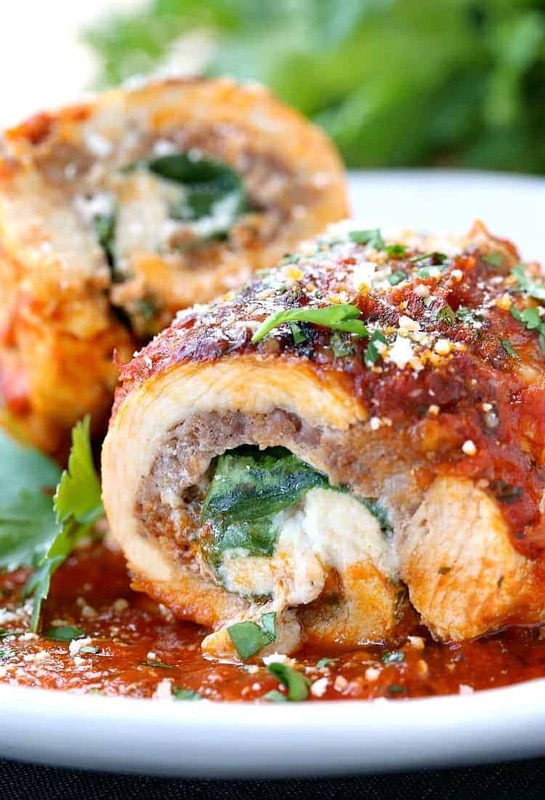 This chicken and sausage rollatini is so good, you won’t believe that it was made at home. This chicken recipe is way easier than it looks too, just head over to the recipe and see for yourself! 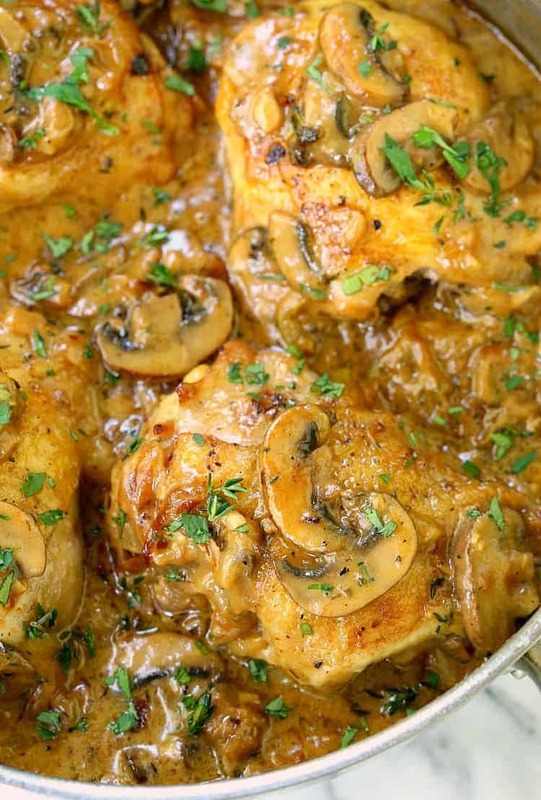 These chicken thighs are submerged in the most amazing sauce made from mushrooms and caramelized onions that almost melt away into the gravy. Talk about a fun dinner for the kids. These chicken rolls can be made with chicken breasts, chicken thighs or whatever leftover chicken meat you have on hand. Yep, you can also grab a rotisserie chicken from the store and shred that up too. 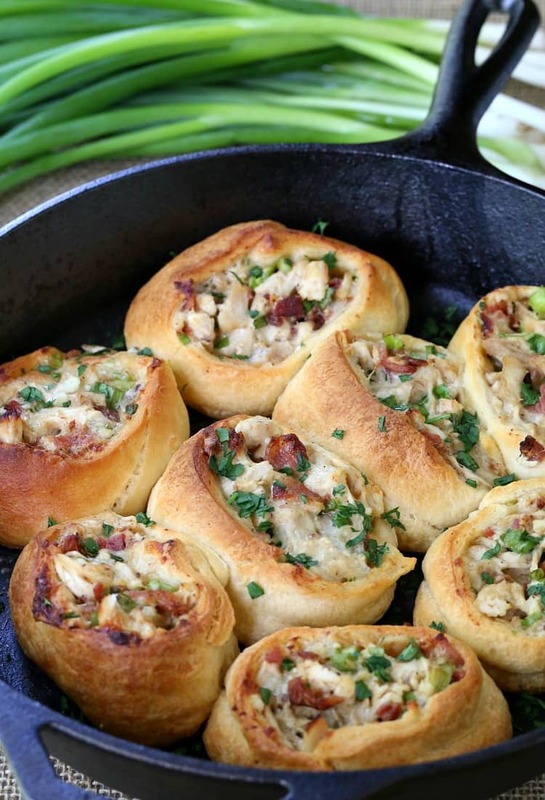 Roll it up in store bought pastry and let them cook away in a buttered cast iron skillet. Dinner doesn’t get much more fun than this! 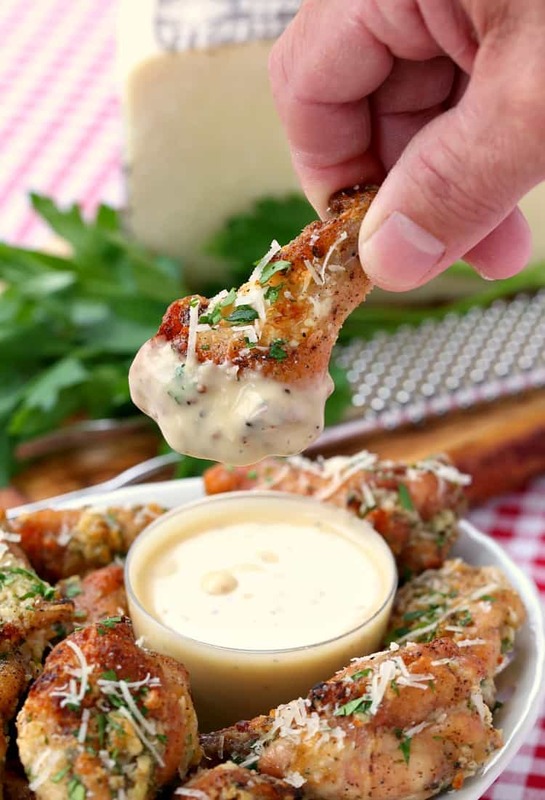 Another awesome chicken wing recipe here. These wings are also baked, but marinated first to get tons of flavor in these wings. 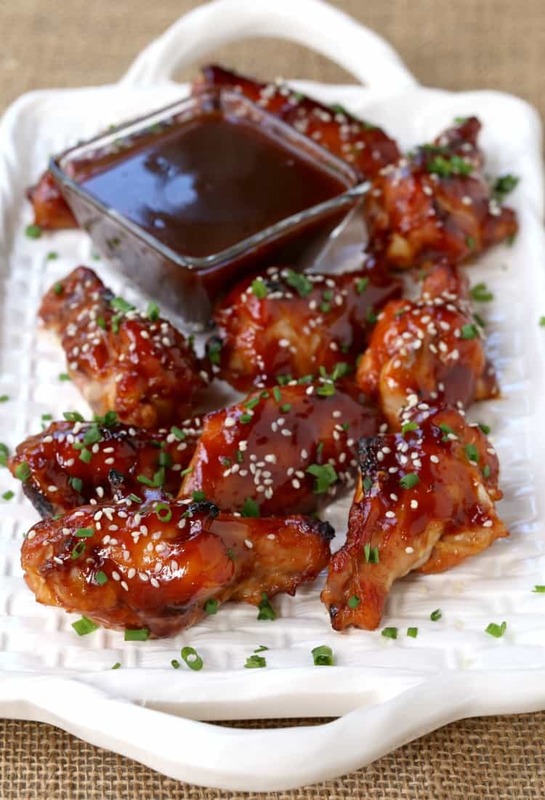 The sauce is sticky and sweet and finger licking amazing. It’s taco time! 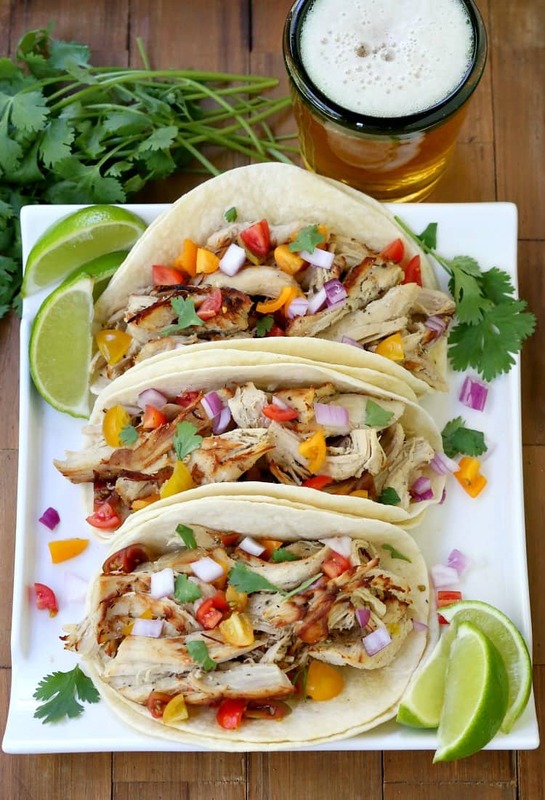 We’ve been making these crock pot chicken carnitas for a long, long time. 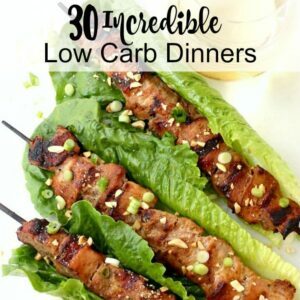 What’s great about them is not only how easy they are but you can eat them super plain as is or load them up with all the taco fixings you want! Perfect for serving at parties so everyone gets what they like. Sheet pan dinners are all the rage these days and for good reason! You’re only messing up one pan (for the most part) and all the ingredients cook together and roast to perfection all while you’re sitting there drinking your cocktail. Or whatever you do while dinner is cooking away. 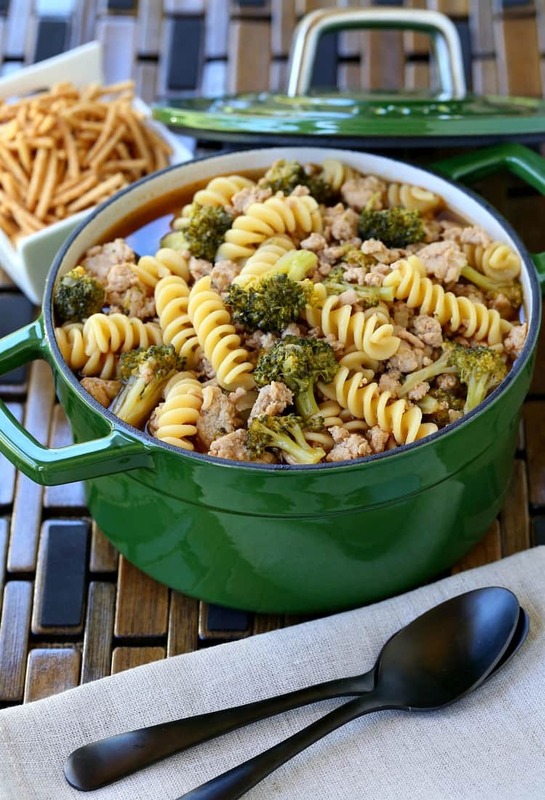 Just look at how awesome this chicken and pasta recipe is! 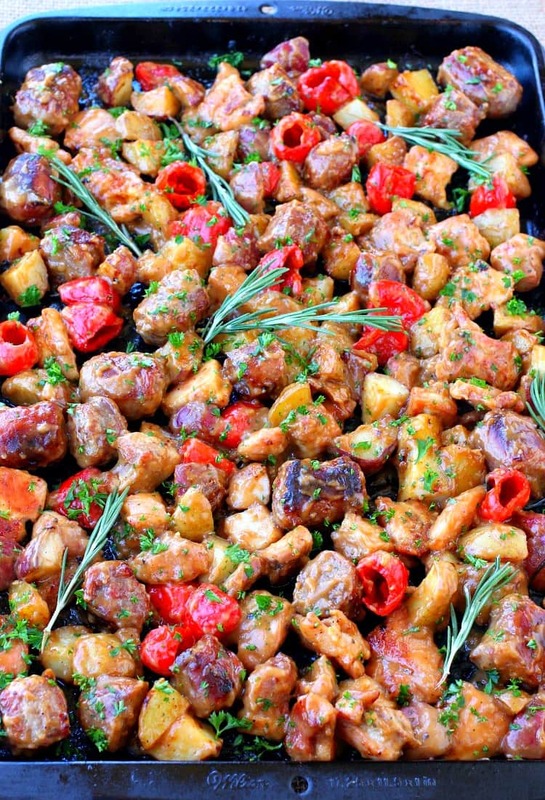 I love this one because – marsala – and because it feeds a crowd. 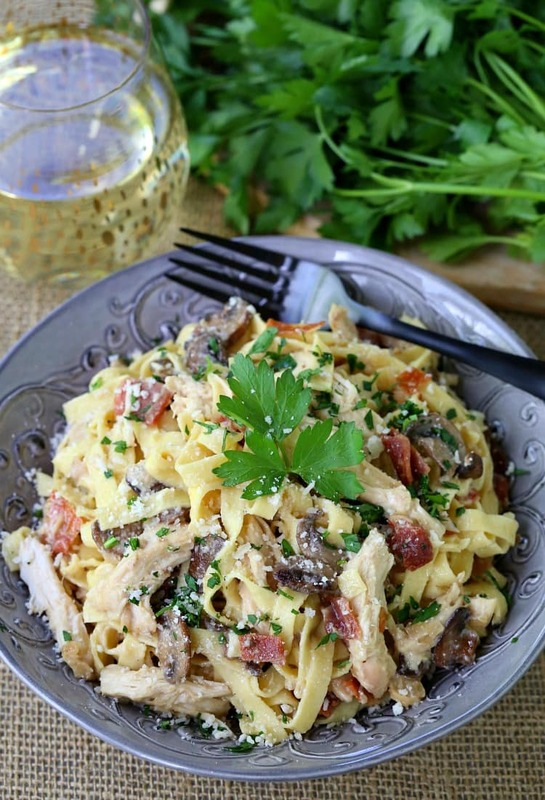 You can use a shredded rotisserie chicken to make this recipe easier and also make to grab fresh pasta so it cooks up super quick! We don’t want to forget about recipes with chicken legs! Again, my boys love a good chicken leg dinner. 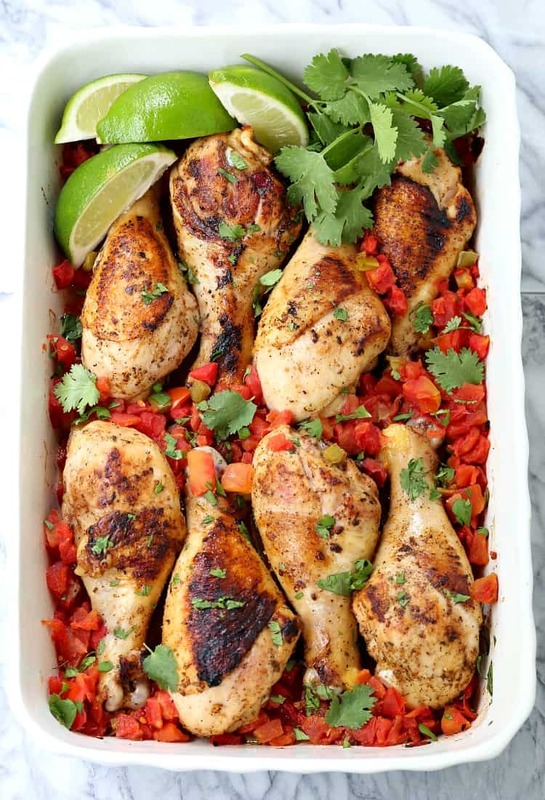 Chicken legs aren’t really my top choice but if you make these Fiesta Chicken Legs for me, I’ll be diving right in there too! This chicken leg recipe is so easy to put together you’ll be buying those chicken legs in bulk! Low carbing it? This low carb sheet pan recipe is one of our favorites! You can swap out the asparagus for broccoli or any other vegetable you like to roast that goes with chicken. You don’t have to choose either! 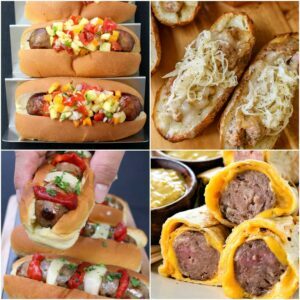 That’s the beauty of sheet pan dinner recipes, you can add on whatever you want! Kids won’t eat their vegetables? Or maybe it’s your husband or wife? 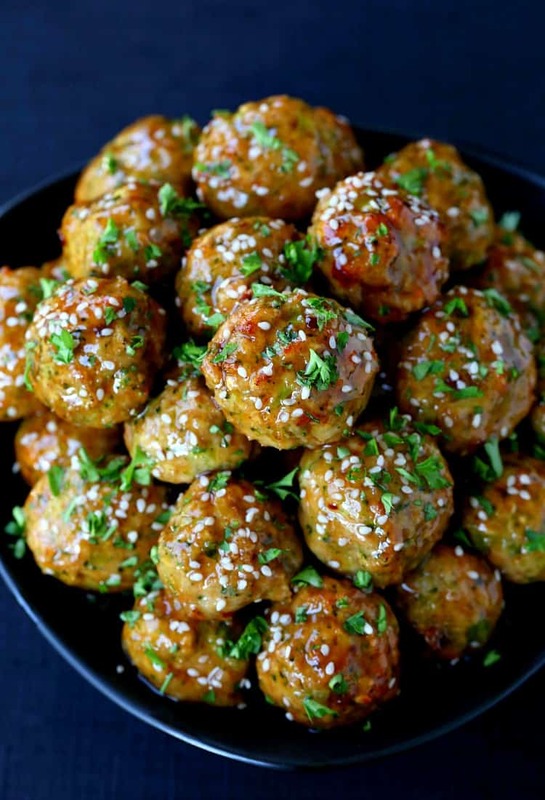 Make these meatballs ASAP. The broccoli is chopped up inside the meatball so you won’t even know it’s in there. You can’t push the broccoli aside for this dinner! Also the glaze that coats these meatballs is so crazy delicious you could pretty much put it on anything and it’s going to be good! Chicken pot pie is one of my all time favorite chicken dinners. We don’t make it too often the old fashioned way with that awesome, flaky crust…baked for about an hour in the oven. But if you make chicken pot pot like in this recipe, you’ll get to have it more. 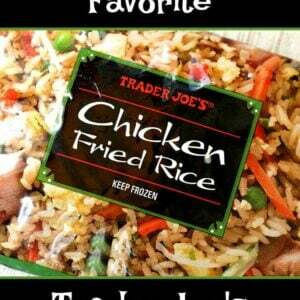 Use some store bought help when you can, there’s no harm in doing that when dinner turns out like this! I can’t tell you how much we love soup for dinner! I should be working on my soup round up post…but I’ll get to that later. This chicken soup recipe has all the flavors you love of chicken and broccoli in a much healthier form! Our kids gobble this one up, I hope your family does too! Back to the chicken thigh recipes…this one is so flipping good I really can’t say enough about it. 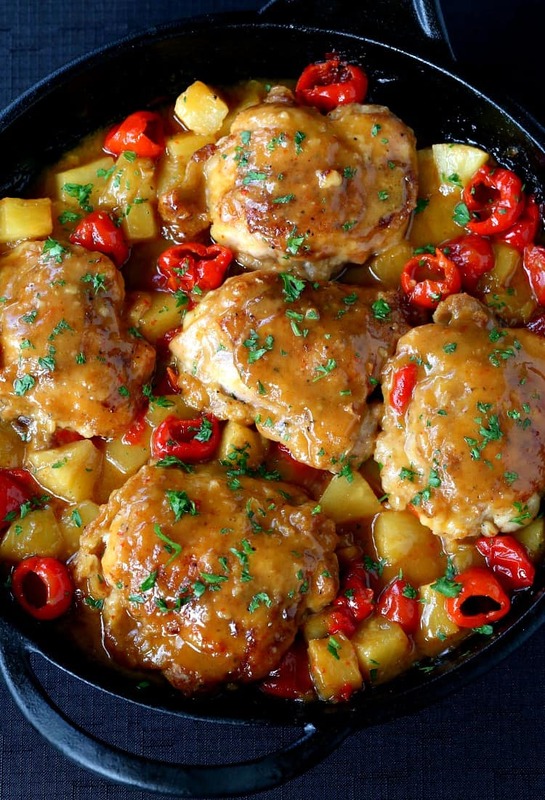 Crispy chicken thighs coated in a sweet and sticky pineapple glaze. You definitely don’t want to miss this recipe! Comfort food recipes, here we come! 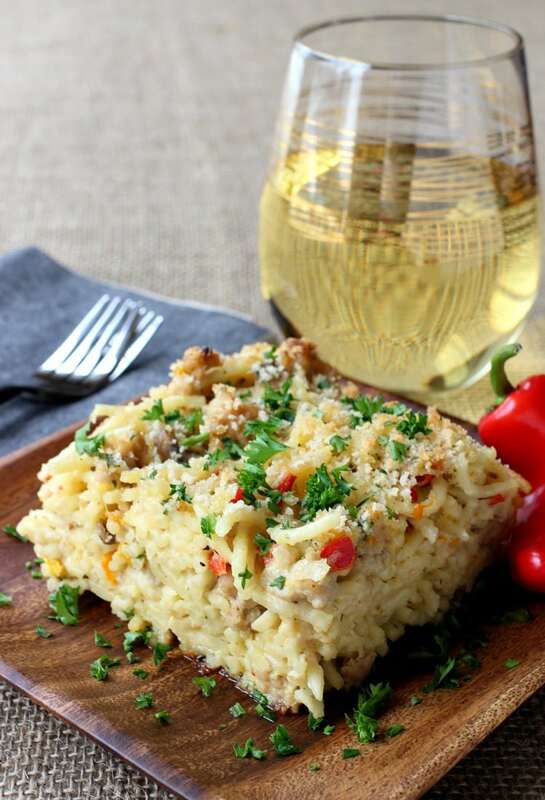 This spaghetti casserole picture should be right there next to the description of comfort food recipes. The creamy sauce that cooks with the shredded chicken and spaghetti is absolutely perfect. 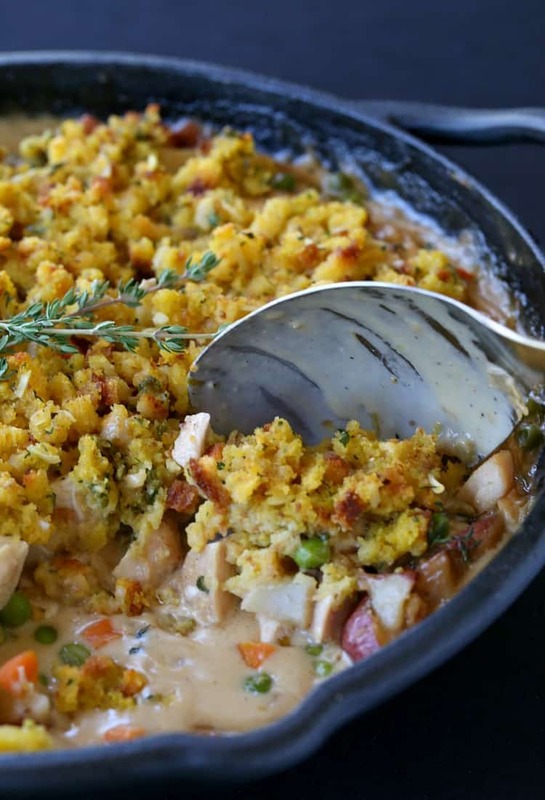 I know what you’re thinking, cider in a creamy chicken recipe? Yep. Just wait until you try it. The acidity in the cider breaks down the creamy riche flavor going on so it’s not too overpowering. 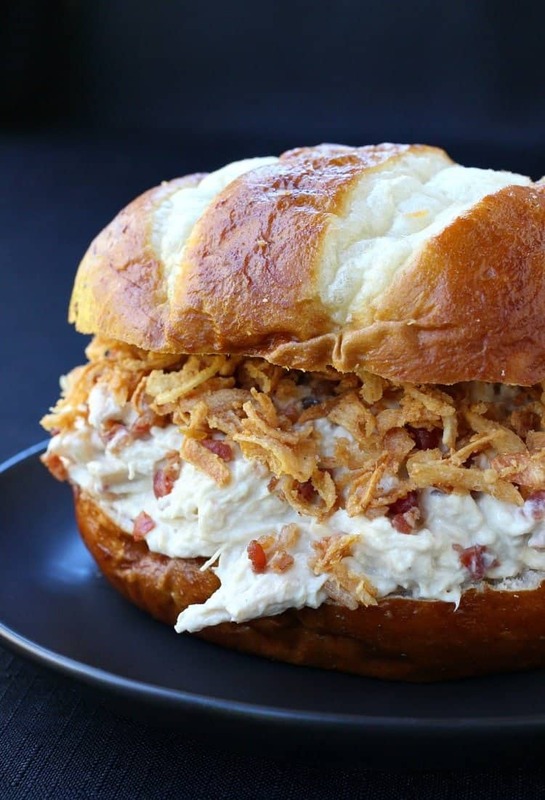 Just delicious, creamy crock pot chicken with bacon that you can load up onto a big fluffy bun. Sounds pretty good am I right? Peanut butter in chili? Yes, it works and you’re going to love it. Think chicken satay with peanut sauce and make it spicy and turn it into a chili recipe. 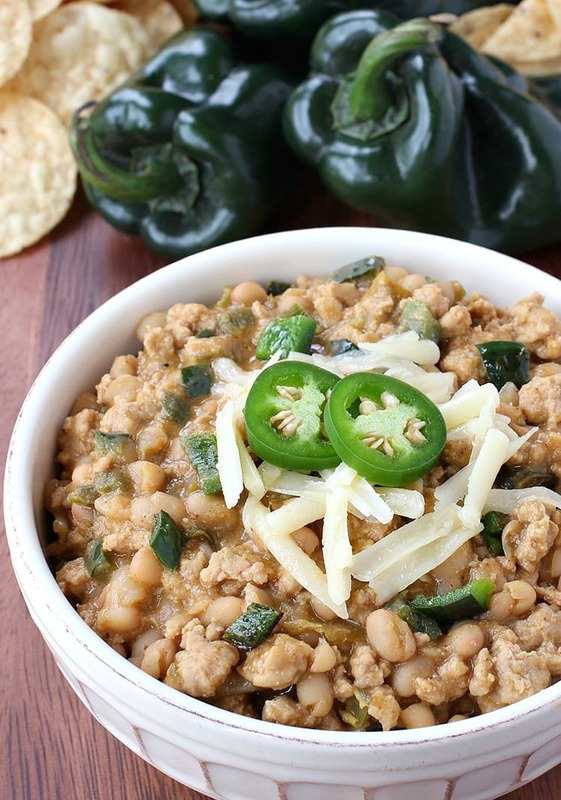 You’ll be surprised at how good this chicken chili is and how often you end up making it! 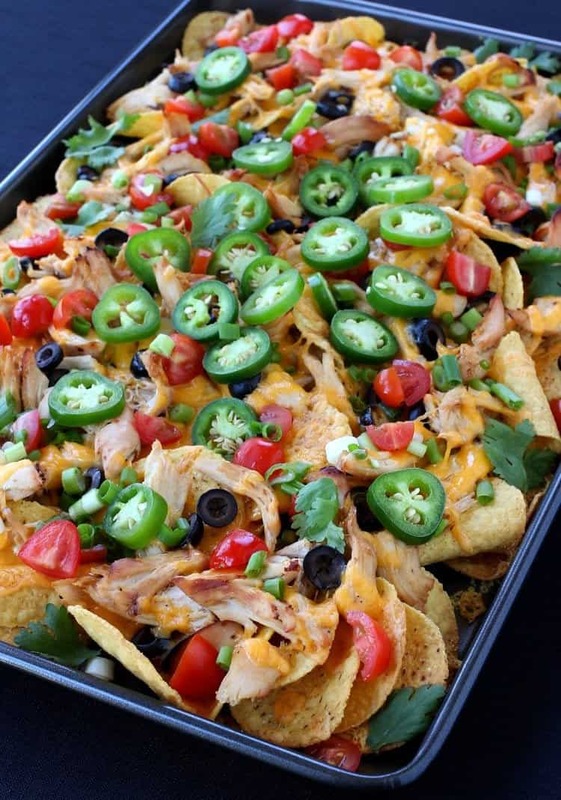 If you can’t decide between chicken wings and nachos…no worries. This recipe has the best of both worlds! 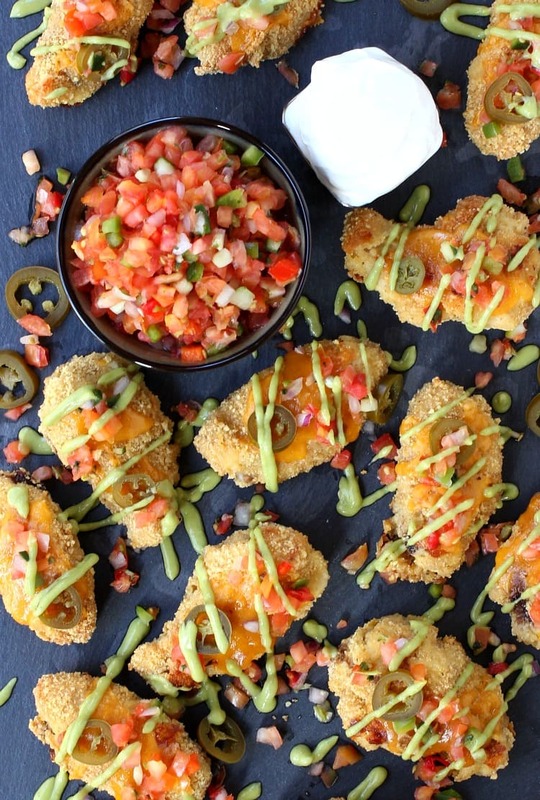 Chicken wings coated in a tortilla chip crust and baked – not fried. Then topped with a guacamole sauce, diced tomatoes an jalapeños. Dinner is served. Ever wonder about what the best chicken meatloaf recipe is? Wonder no longer, here it is. 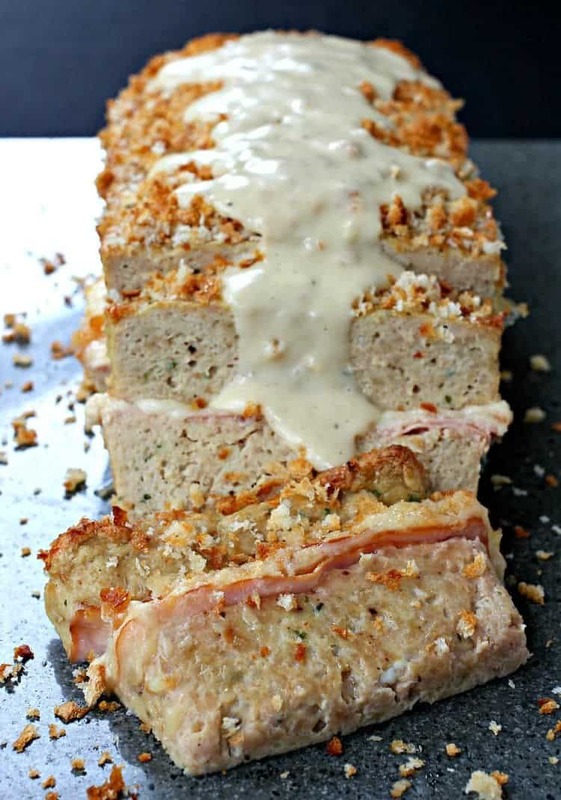 This chicken meatloaf has a layer of ham and Swiss cheese in the middle. You’ll never have a more juicy chicken meatloaf, I can promise you that! Don’t forget the creamy dijon gravy for topping. Let me know if any of Our Favorite Chicken Dinner Recipes land on your families dinner rotation! 10 Easy Cold Spiked Apple Cider Cocktail Recipes You Must Try!